Which action should be taken when planning for redundancy on a hierarchical network design? Immediately replace a nonfunctioning module, service ,or device on a network. Purchase backup equipment for every network device at the distribution layer. 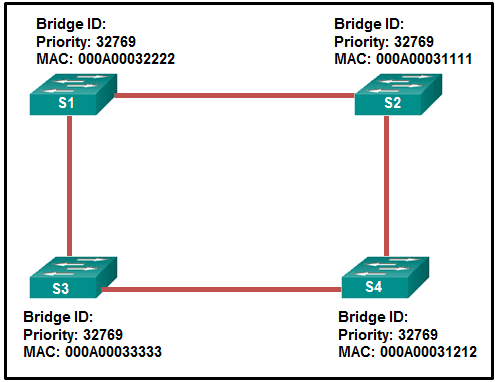 Implement STP PortFast between the switches on the network. Add alternate physical paths for data to traverse the network. What is the function of STP in a scalable network? It disables redundant paths to eliminate Layer 2 loops. As the network administrator you have been asked to implement EtherChannel on the corporate network. What does this configuration consist of? What is the function of ASICs in a multilayer switch? They provide power to devices such as IP phones and wireless access points through Ethernet ports. They streamline forwarding of IP packets in a multilayer switch by bypassing the CPU. They prevent Layer 2 loops by disabling redundant links between switches. They aggregate multiple physical switch ports into a single logical port. Reset the VTP counters to allow the switch to synchronize with the other switches in the domain. Download the VTP database from the VTP server in the new domain. Configure the VTP server in the domain to recognize the BID of the new switch. Select the correct VTP mode and version. Configure the switch with the name of the new management domain. Refer to the exhibit. 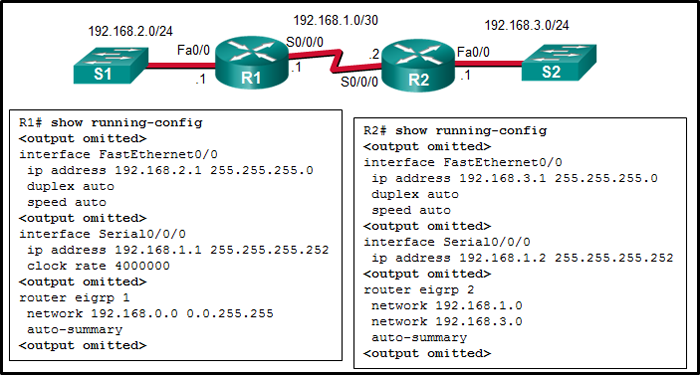 The partial configuration that is shown was used to configure router on a stick for VLANS 10, 30, and 50. However, testing shows that there are some connectivity problems between the VLANs. Which configuration error is causing this problem? A configuration for the native VLAN is missing. There is no IP address configured for the FastEthernet 0/0 interface. They are not associated with a particular VLAN. The interface vlan <vlan number> command has to be entered to create a VLAN on routed ports. They support subinterfaces, like interfaces on the Cisco IOS routers. They are used for point-to-multipoint links. In a switched network, they are mostly configured between switches at the core and distribution layers. Refer to the exhibit. A network administrator is configuring PVST+ for the three switches. What will be a result of entering these commands? 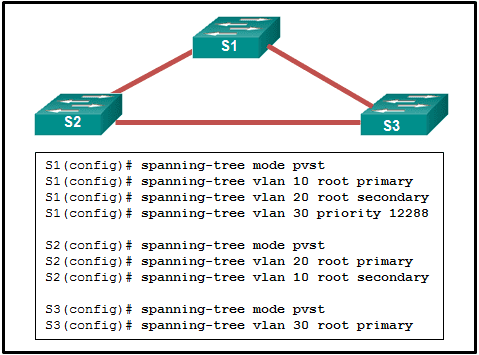 S3 will set the priority value for VLAN 30 to 8192. Refer to the exhibit. If the switch has been configured for PVST+ mode, what command output would replace the question marks? Which function is provided by EtherChannel? Which technology is an open protocol standard that allows switches to automatically bundle physical ports into a single logical link? Refer to the exhibit. A network administrator has connected two switches together using EtherChannel technology. If STP is running, what will be the end result? The switches will load balance and utilize both EtherChannels to forward packets. STP will block one of the redundant links. The resulting loop will create a broadcast storm. Both port channels will shutdown. All the interfaces need to work at the same speed. All the interfaces need to be working in the same duplex mode. A network engineer is configuring a LAN with a redundant first hop to make better use of the available network resources. Which protocol should the engineer implement? Which dynamic routing protocol uses hop count to calculate metric value? Which statement describes the Autonomous System number that is used in EIGRP? It defines the reliability of the EIGRP routing protocol. It identifies the priority of the networks to be included in update packets. It is associated with the global Autonomous System number that is assigned by IANA. It specifies the EIGRP routing process on a router. Refer to the exhibit. A network administrator issues the show ip protocols command. Based on the exhibited output, what can be concluded? 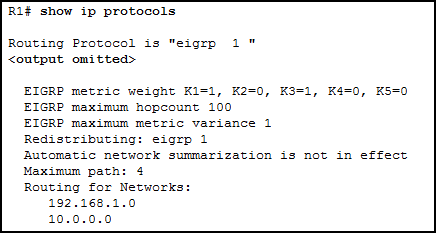 The EIGRP K values are default values. 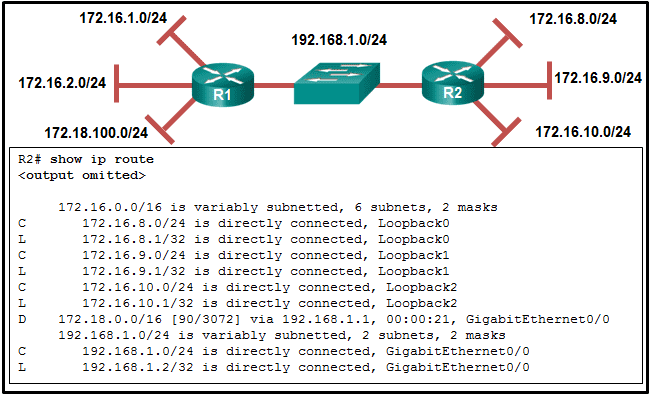 R1 receives routes to the network 192.168.1.0/24 and 10.0.0.0/24. The no auto-summary command is not applied for the EIGRP operation. Up to 4 routes of different metric values to the same destination network will be included in the routing table. Refer to the exhibit. A network administrator has issued the show ip eigrp neighbors command. What can be concluded from the output? There is no incoming EIGRP message at this moment. The first EIGRP neighbor R1 learned about has the IP address 10.10.10.2. An EIGRP neighbor with IP address 10.10.10.14 is connected to R1 via serial interface 0/1/0. If R1 does not receive a Hello packet in 4 seconds from the neighbor with IP 10.10.10.18, it will declare the neighbor is down. Which feature of the EIGRP routing protocol can provide fast re-convergence without DUAL recomputation in the event of a route failure? Refer to the exhibit. An administrator attempts to configure EIGRP for IPv6 on a router and receives the error message that is shown. Which command must be issued by the administrator before EIGRP for IPv6 can be configured? Refer to the exhibit. What will Router1 do if it receives packets that are destined to network 172.16.4.0/24? Refer to the exhibit. 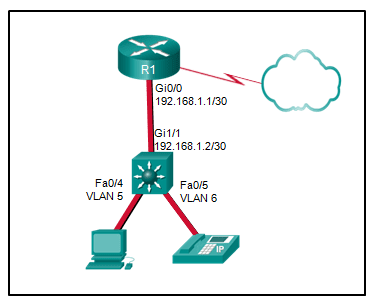 Which command will configure unequal-cost load balancing with EIGRP on the HQ router? Refer to the exhibit. Why did R1 and R2 not establish an adjacency? The AS number does not match on R1 and R2. The automatic summarization is enabled on R1 and R2. Refer to the exhibit. The routing table on R2 does not include all networks that are attached to R1. The network administrator verifies that the network statement is configured to include these two networks. What is a possible cause of the issue? The AS number does not match between R1 and R2. The network statements should include the wild card mask. The no auto-summary command is missing in the R1 configuration. The interfaces that are connected to these two networks are configured as passive interfaces. A network administrator is troubleshooting the EIGRP routing between two routers, R1 and R2. The problem is found to be that only some, but not all networks attached to R1 are listed in the routing table of router R2. What should the administrator investigate on router R1 to determine the cause of the problem? Does the AS number match the AS number on R2? Does the hello interval setting match the hello interval on R2? Do the network commands include all the networks to be advertised? Is the interface connected to R2 configured as a passive interface? 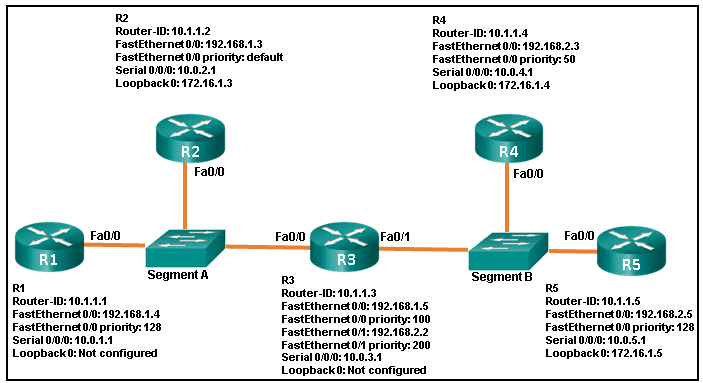 What is the order of packet types used by an OSPF router to establish convergence? Which wildcard mask would be used to advertise the 192.168.5.96/27 network as part of an OSPF configuration? What is the reason for a network engineer to alter the default reference bandwidth parameter when configuring OSPF? Which OSPFv3 function works differently from OSPFv2? What address type will OSPFv3 use to form adjacencies to neighboring routers? 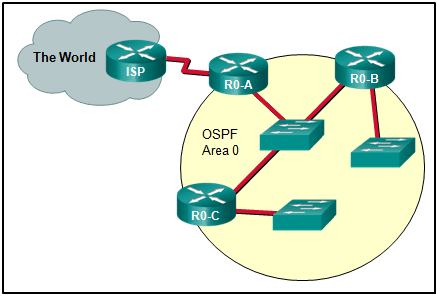 On what type of OSPF router is interarea route summarization configured? Which type of OSPF LSA represents an external route and is propagated across the entire OSPF domain? Which OSPF LSA type is only used in multiaccess and NBMA networks? Refer to the exhibit. What can be concluded about network 192.168.1.0 in the R2 routing table? This network was learned through summary LSAs from an ABR. What is one reason to use the ip ospf priority command when the OSPF routing protocol is in use? If the DR fails, the new DR will be router B. If a new router with a higher priority is added to this network, it will become the DR. If the priority of router C is changed to 255, then it will become the DR. Refer to the exhibit. On which router or routers would a default route be statically configured in a corporate environment that uses single area OSPF as the routing protocol? Refer to the exhibit. A network administrator has configured OSPFv2 on the two Cisco routers as shown. The routers are unable to form a neighbor adjacency. What should be done to fix the problem? 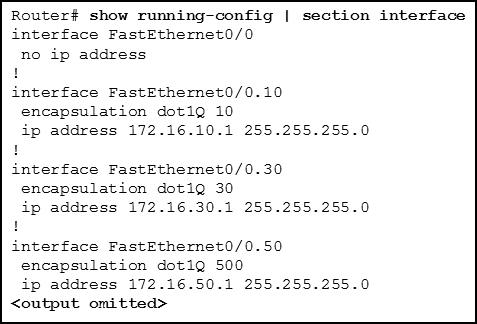 Remove the FastEthernet0/0 passive interface configuration on router R1. Add the command network 192.168.20.1 0.0.0.0 area 0 on router R1. Add the command network 192.168.30.0 0.0.0.255 area 0 on router R1. Change the IP address on S0/0 of router R2 to 192.168.20.2. In RSTP, BPDU frames are sent every 2 seconds by default. 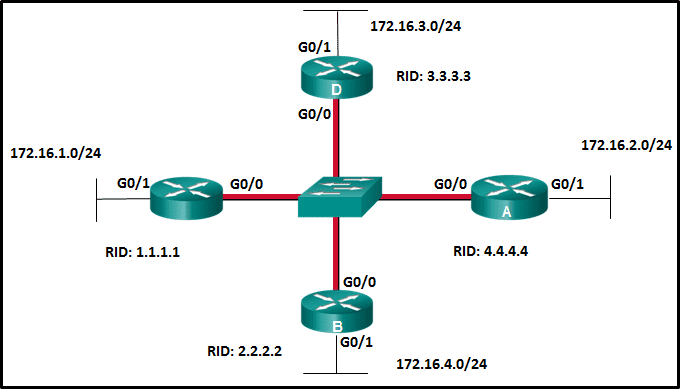 EIGRP keeps feasible successor routes in the topology table. By default, EIGRP is able to use up to 50 percent of the bandwidth for EIGRP messages on an EIGRP-enabled interface.